These lil purple globes are a powerhouse fruit that is amazing for your health and your skin! It’s so important to have restorative, hydrating foods in your diet when healing from eczema. Grapes are amazing because they are fiber and water-rich which is great for cleansing the digestive tract and they are super alkaline for the liver and kidneys as they help to pull metabolic wastes from them. When these detox channels are filtering properly, then eczema can’t stand a chance! We must cleanse internally to see external healing. The last channel of elimination, the skin, will no longer have the heavy burden of detoxing once the internal channels of elimination are working the way they should. 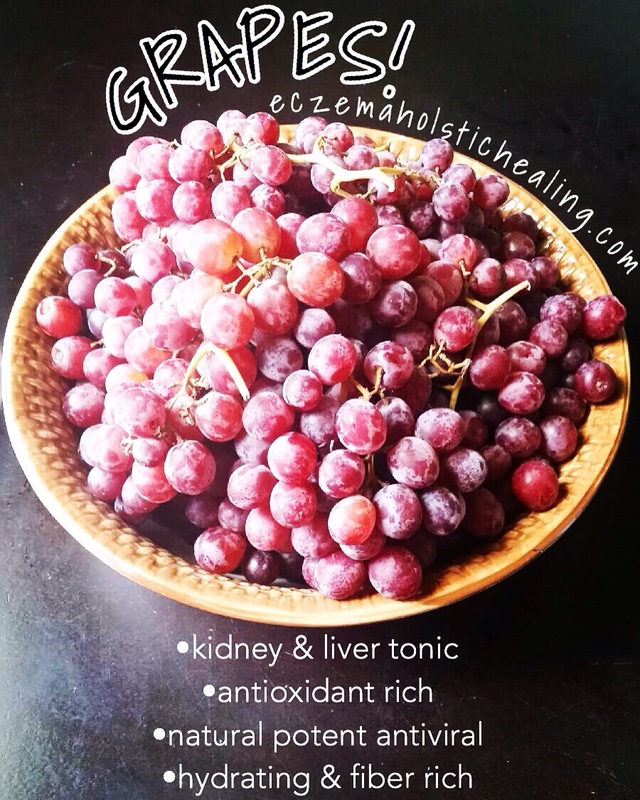 You can even do a full-on grape fast as it can be the most healing for detoxification. Check out more info on DETOXING WITH FRUIT.